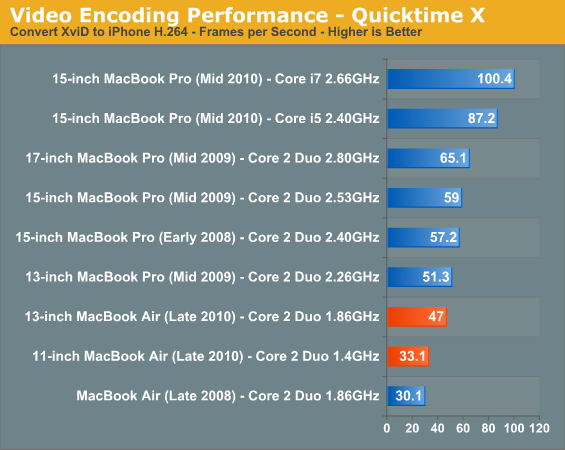 Benchmarking under OS X isn’t difficult, you just need to get creative. 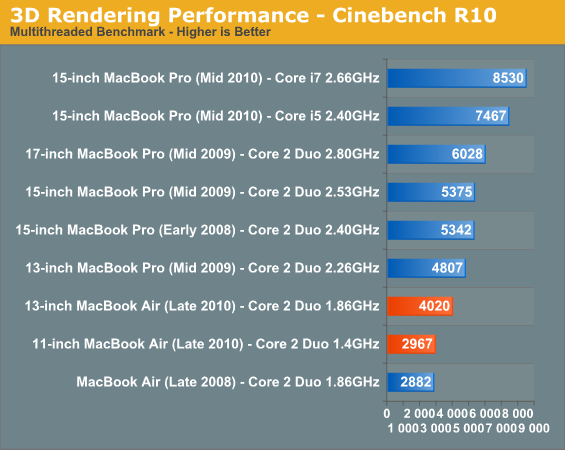 Luckily I’m in dire need of creative outlets so creating OS X benchmarks works for me. I’m using the same tests I introduced in my Holiday 2009 Macbook Pro roundup and running on the launch hardware for each notebook listed in the charts. We’ll start with general application performance. General OS usage is a difficult thing to quantify, but one measure of performance has always been the number of bounces an icon in the dock makes before an application loads. I decided to take it to the next level and write a quick script to launch 15 applications in a row, timing how long the entire process takes. I launched, in order: Mail, Safari, Activity Monitor, iTunes, iCal, DVD Player, iPhoto, Photo Booth, Quicktime Player, Disk Utility, Preview, iMovie, Front Row, Garage Band and Aperture. The entire process stresses both the disk and CPU, which is why we see a huge improvement when going to an SSD as well as differences between CPU speeds. What a difference an SSD can make. 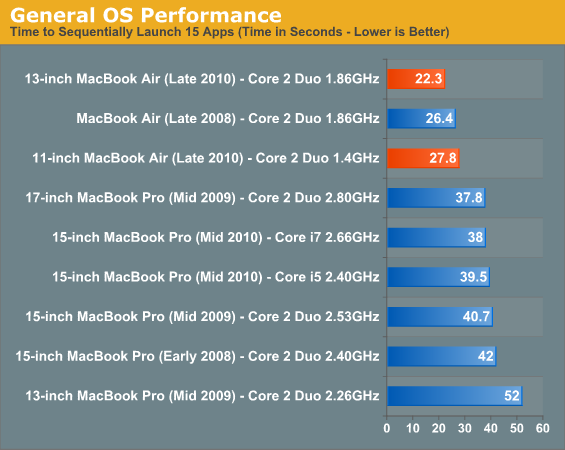 The 13-inch MacBook Air is the fastest standard shipping configuration Apple offers in this benchmark. 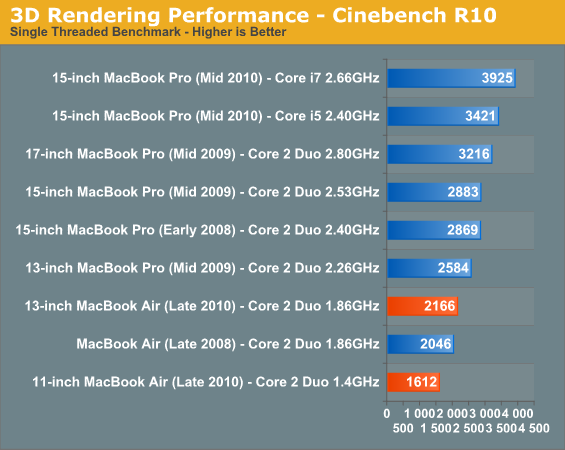 The fact that there's a measurable difference between the 13-inch and 11-inch models shows you just how slow that 1.4GHz Core 2 really is. 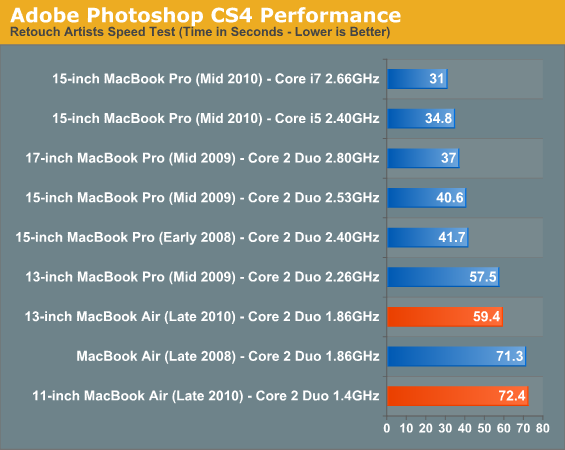 The Retouch Artists Speed Test we use for our CPU testing under Windows also works under OS X. We're running the exact same benchmark here, basically performing a bunch of image manipulations and filters and timing the entire process. For my Aperture test I simply timed how long it took to import 203 12MP RAW images into the library. 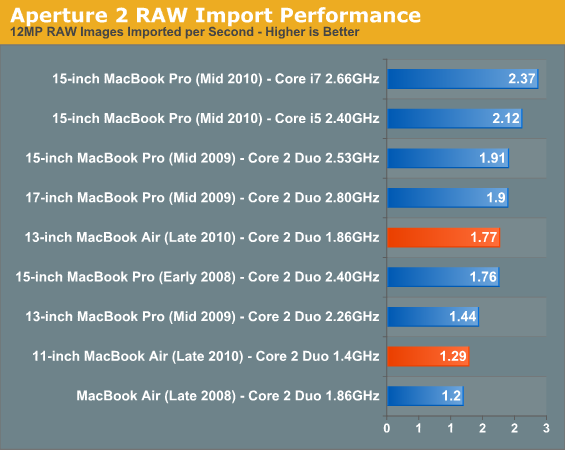 The SSD makes the 13-inch MacBook Air far more competitive than it should be here. It's even faster than a two year old 15-inch MacBook Pro. The 11-inch MBA is faster than the old 13-inch MBA due to its better thermal characteristics as we pointed out earlier. Our final benchmark is more consumer focused. Here I'm taking an XviD and converting it to an iPhone-supported H.264 format.
" If Apple produced some type of easy to use syncing software so that you could use the Air as a portable version of your main computer's contents, it would be the perfect road companion to an iMac, Mac Pro, or even a 17-inch Macbook Pro." Apple sell 'mobile me' which pretty much does this. It gives you an 'iDisk' in the cloud, accessible from any of your machines (think it supports windows too? ), plus there's an iphone app to access it. It also syncs your bookmarks, preferences, dock icons (don't think it syncs the actual apps though) and keychain (for passwords). There's push email + web hosting (main thing I use it for) and other bits too. 1) The Macbook 13 (the white one) simply needs to die. Apple has needed a price overhaul since the company's inception. And as shocking as this may seem to Mac users, this is still a major premium over PCs. Nothing you wrote makes sense. How much is the ULV CPU from Intel? How much is the LV CPu from Intel? How much is that Nvidia 320M? How much does it cost to mill an aluminum case? How much are 9.5mm ultra-slim slot-loading BRDs? Can you find any for sale? Which Core-i3 LV and ULV chips will they use? Which USB3.0 controller will they use, how much will cost, where will go in the Airs? Where will this ExpressCard slot go? Why scrape the 11, 13 and 15” Mac notebooks for 12, 14 and 16” displays?